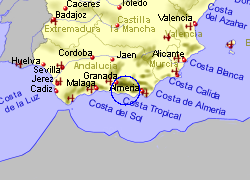 Lying between the southern slopes of the Sierra Nevada and the Costa Tropical coastline of Granada province, the Alpujarras are a unique part of Spain for several reasons. 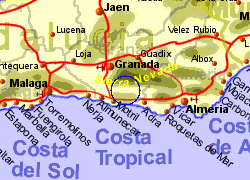 The area became home to the Moors pushed out of Granada in the 15th century and the fifty or so villages became one of their last strongholds before being driven out in the 16th century. The villages in the area are composed of clusters of squareshaped houses with flat roofs, similar to those found in the Rif and Atlas mountains of Morocco. The peeks of the Sierra Nevada, rising to over 3,400m have a covering of snow for much of the winter, and the meltwaters flowing in the rivers irrigate the land, the rivers having also deposited fertile soil. This land has been built into terraces and cultivated for the last 2000 years, becoming even more productive after the Moors built an intricate system of drainage chanels to get the water where they wanted it. 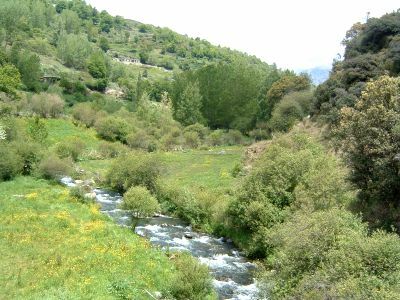 The lower Alpujarras grow oranges, apples chestnuts and avocados, where local farmers may earn a poor living , while the upper Alpujarras have attracted tourists, both Spanish and foreign, for walking holidays. Orgiva is the largest town in the west of the area, this market town sits in the fertile valley of the lower Alpujarras at around 450m above sea level and is likely to be on your route in if approaching from the west. The village of Trevelez on the otherhand is the highest village in Europe at nearly 1500m above sea level and is famous in Spain for the jamón serrano (cured ham) which is dried in the clean mountain air there. The village itself overhangs a fast flowing river in a steep sided valley. You will also find craft shops, bars and places stay before heading of on the track up into the sierra. Other villages acting as possible starting points for trecks into higher areas include Pampaneira, Bubion, Capileira, Pitres, Portagos, and Busquistar. 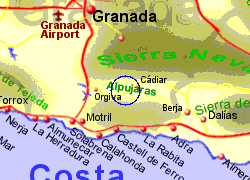 Map of the Alpujarras area.